From birth onward, children need safe and stimulating places to learn and discover the world. The home is one of those places. But with more parents needing to work outside the home, many rely on daycare centers or other childcare settings to nurture and teach children for substantial periods of time. Just as with schools, not all childcare is the same. 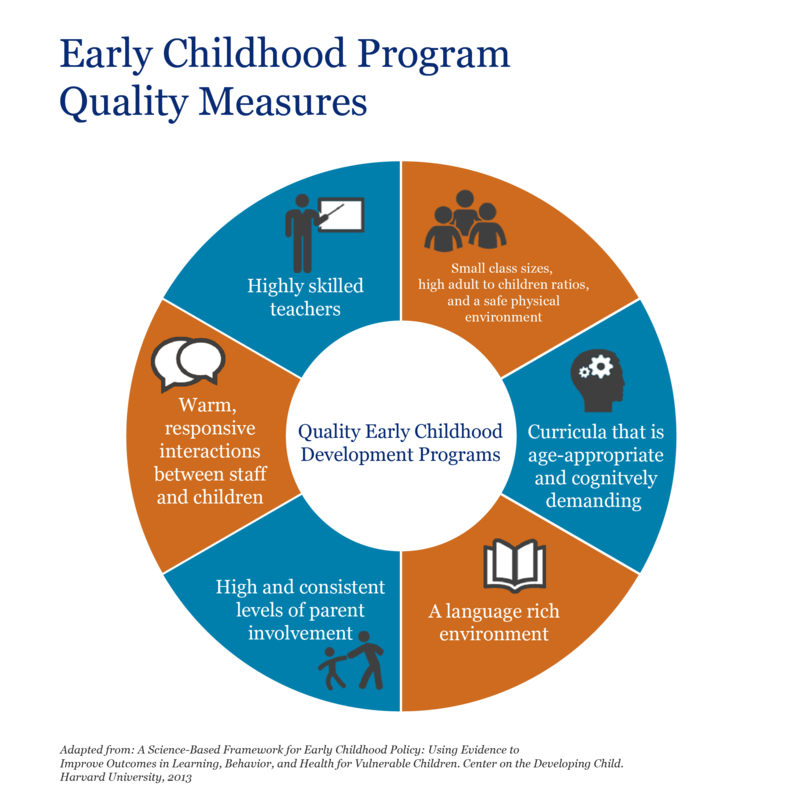 While there is good evidence that high quality early learning environments can produce substantial long-term benefits for low-income and at-risk children,1 the availability and affordability of high quality programs remain inadequate. For more about the evidence around investing in early childhood education, see Quality Early Learning Programs Are Worth the Investment: Q&A with Dr. Steven Barnett. High Impact Opportunities: Our analysis of a specific, evidence-based program, including impact, costs, and cost per impact. Additional examples: Programs whose work aligns with one of our strategies, but that have not yet been analyzed by our team. Other ways donors can follow our strategic guidance beyond supporting direct service programs, such as getting involved in advocacy or systems building at the local, state or national levels. Federal Head Start and Early Head Start are currently the largest programs providing preschool and infant/toddler care for low-income families. Head Start contracts with independent providers of early learning services at the state and local level. Independently, a growing number of states (Oklahoma and Maryland, for example) and localities (Boston, Washington D.C.) have also established and funded preschool programs, some universal (i.e. open to all children independent of income level). While access to preschool and early care varies considerably from state to state,2 there are still more children who would benefit from an affordable, high quality early learning center than there are spots to be had. An estimated 63% of low-income 3-4 year old children in the U.S. do not attend nursery or preschool.3 In the 2012-13 fiscal year, Head Start and Early Head Start served 1.1 million children ages birth to five. With over 6 million children ages birth to five living in poverty,4 many children, particularly in the birth to three age range, are still not being served. Creating more high quality, affordable spaces is one way donors can help address the problem. Improving the quality of existing programs that serve at-risk kids is therefore another promising strategy for funders. Note: For ways to improve teaching of vocabulary and pre-literacy skills, see also: Prepare kids to be strong readers. Acelero works with affiliated Head Start centers to improve quality of adult/child interaction and children’s kindergarten readiness. Acelero provides materials, training, data management, and a community involvement component to raise the quality bar for existing programs. Encouraging non-profit providers to participate in state and local government certification programs is another way funders can help raise quality.6 In Pennsylvania, for example, the United Way has played an important role in helping independent preschools and childcare centers improve their physical plant, curricula, and materials and invest in teacher professional development as part of the Keystone Stars and Pre-K Counts programs. Other quality-enhancing investments include the adoption of research-tested evaluation tools, such as CLASS, and related teacher professional development.7 The CLASS tool is available along with associated training from Teachstone. For more information on research-tested curricula, evaluation tools, and professional development, see our blog entry Q&A with Dr. Robert C. Pianta. The Dunbar Learning Complex in Atlanta includes both an Educare early learning center and a public elementary school in close proximity. Both schools work together to serve children from birth through 5th grade. Children’s learning doesn’t stop at 3PM with the end of school. Making sure children in the early years of elementary school have safe and engaging places to go after school and during non-school time is another way to take action. BELL provides high quality and evidence-based summer and after-school programs to elementary-aged children. BELL works in conjunction with schools and parents and has demonstrated improved learning levels and engagement among participants. Funding a non-profit directly is not the only option for donors seeking better quality and affordability of early learning options. Advocacy can be another high impact approach. For example, discussions with private and public sector leaders convened by Educare, the Ounce of Prevention, and other early childhood advocates contributed to the state of Kansas’ decision in 2008 to establish an $11 million early childhood block grant, with a set-aside for infants and toddlers. As a funder, you can be a powerful voice advocating for the needs of children. Child Care Aware is a source of information for parents and providers about childcare quality standards and costs. Child Care Aware also advocates for policy changes that benefit children and families. The Ounce of Prevention supports both direct service programs in early childhood targeted to low-income children, and also advocates on behalf of better access to programs for low-income children nationally. The Ounce has also produced an advocacy toolkit. Alliance for Early Success brings funders, state, and national policy makers together with the goal of improving state policies for children from birth to age eight. The First Five Years Fund focuses on improving federal level policy to benefit early learning. Too Small to Fail is a campaign started in 2013 with the mission of helping parents, businesses, communities, and policy makers promote the well-being of young children through information dissemination and advocacy. Ready Nation is a partnership of business leaders dedicated to support and advocacy for investments in early childhood. For more information on ways donors can engage with the public sector to improve early childhood outcomes, see Patching the Quilt: Early Childhood Policy & Finance for Donors. 1 Risk factors include living near or below poverty level; single parent household; first language other than English, and mother with less than a high school education. The two most robust and long-term studies remain the Perry Pre-School study and the Abecedarian Program study, both of which have tracked participant outcomes well into adulthood. 3 Kids Count Data Base. Original sources: U.S. Census and American Community Survey for 2009-2001. Estimate is for children living below 200% of federal poverty line. 5 Kids Count Data base. Number of children under 5 living in poverty in 2012 estimated at 6,052,000 or 26%. Original data source: U.S. Census 2000 plus American Community Survey 2012. 6 High quality state and local programs that have shown substantial and sustainable positive results for children’s learning include Boston Pre-K, Keystone Stars and Pre-K Counts in Pennsylvania, North Carolina’s More at Four, and the state of Maryland’s Extended Elementary Education program (summary of recent research by Robert Pianta, University of Virginia, as yet unpublished). 7 Teachstone (https://www.teachstone.com/about-teachstone/), a company established with the participation of the developers of CLASS, is one source of training and materials. CLASS has been adopted by Head Start as a primary evaluation tool in the last few years.